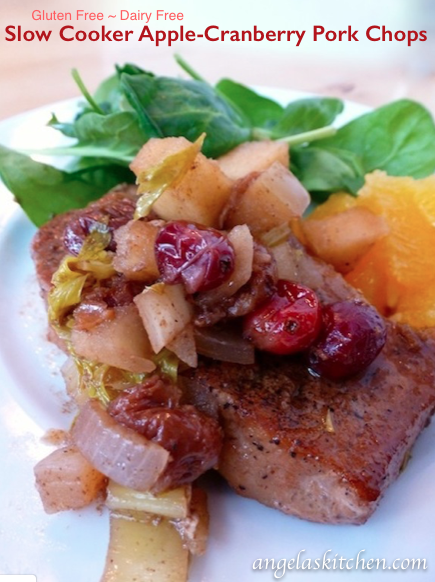 Printable recipe card for multiple batches of Apple-Cranberry Pork Chops for the freezer. Season pork chops with salt and pepper. Put pork chops in gallon sized freezer bag (one bag per batch). Mix together remaining ingredients. Put fruit mixture over pork chops. Remove as much air as possible. Seal, label and freeze. To serve: Thaw. Lightly oil the crock of your slow cooker. Place pork chops on the bottom of crock. Pour fruit mixture over chops. Cover with lid. Cook on low for 6 to 7 hours until pork is tender.